These plugins will probably never hit the market because either their function is rather specialized and not needed by more than a handful of people or we don’t have the time to make them worthy of a real release. If you found them usable but want more or improved features, send us a e-mail and we’ll see what we can do. All these are for Windows 32Bit hosts (or bridged in 64bit hosts). 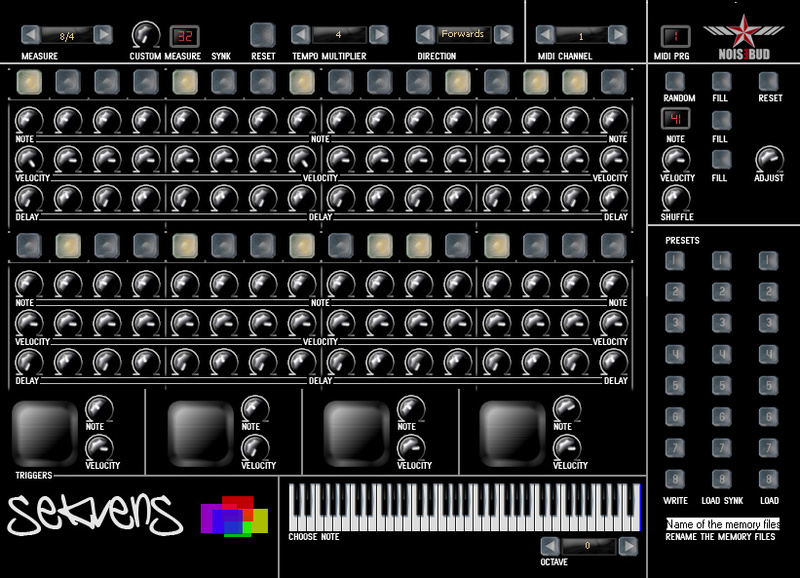 Sekvens is a sequencer made for live use on stage. Apart from all regular sequencer functionality it has a couple of features that make this more of an instrument than a sequencer; you can save any state at any time and recall that state with just the push of a button, the saved states will be there the next time you open your project (even if the project crash) so you can bring that epic sequence with you from one gig to another. Map the four triggers to drum pads (or any midi button) for play in real time. WavDad is a spin off product from CatchDad. All the same controls but instead of recording sounds on the fly you load a sample. We made it cause the thought of being able to built up an entire live set from scratch programming your drums and rhythms on the fly on stage is very appealing. We might continue develop this little thing but put it on ice for now. Use it if you like it, if enough people ask for further development it might happen. Just a simple midi monitor plugin, we made it for use in Ableton Live but it should work in any Windows VST host. Put the DLL in your VST folder. We needed a easy and fast way to determine if there’s audio present on a specific channel when we play live and come up Ledlit. Ledlit lits the leds on a JL Cooper CS-10 when audio is present on a channel in Ableton (works in other DAW’s as well). VST’s doesn’t handle Sysex messages so we made it send a choose able CC and then we convert it to sysex with Bomes midi translator. Since Ledlit sends CC’s you can use it to lit any leds that is assigned to a midi CC. It only sends 0 (00) and 127 (7F) and has a pretty advanced engine to reduce the amount of midi that is sent from the plug. If you compare it with other similar plugins you will notice that this is what make Ledlit special and is also the reason why we made it, Bome’s can’t handle the amount of data put out from i e Gatefish and Ledlit is better prepared for streaming audio than different drum triggers out there. Similar to Ledlit but this uses the four vertical leds on the JL Cooper CS-10 as a master VU and it sends 1-4 on a assignable CC to display the 1/4 in the 7 segment display. Same thing here as with Ledlit, you’ll need Bome’s to make it work. If you don’t know how to program Bome’s we can send you our patch.